If precipitations falls on high ground, they exhibit so-called potential energy: On their way down through the valleys to the sea, the water can do work. - Therefore, mountainous countries with sufficient rainfall are particularly suitable for making use of hydropower. 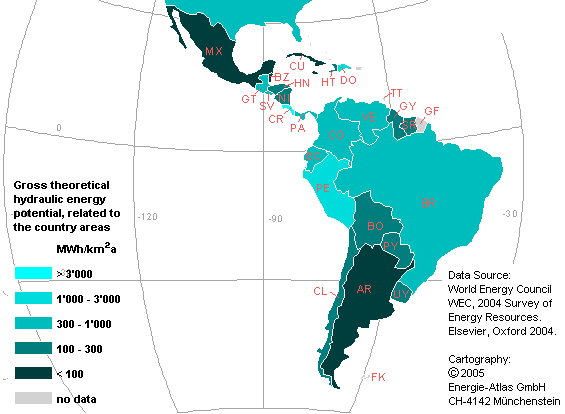 The map shows the theoretical energy potential in relation to the country area, in MWh/km²a. The values are based on the Survey of Energy Resources 2004, published by the World Energy Council WEC. They have been used with permission of the editor Elsevier, Oxford.